Qualifying for the Olympics or Paralympics is about taking athletic performance to the next level. Sometimes it’s also about taking rehabilitation to the next level. 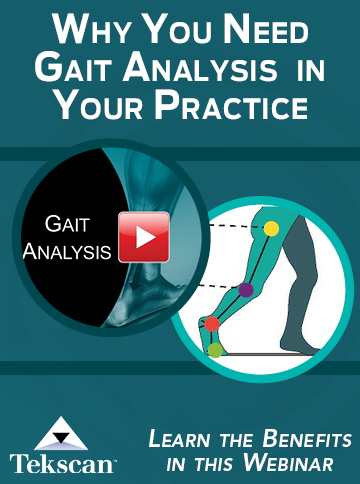 That’s where lower extremity practitioners come in. On January 22, a month before she was to compete in the Winter Olympics, Canadian skier Julia Murray tore up her knee at a World Cup race in Lake Placid, NY. She severed her anterior cruciate ligament almost completely, partially tore her medial collateral ligament, and damaged both her medial and lateral menisci. It was a devastating injury, one that for most athletes would entail immediate surgery and a recovery lasting months. Murray, however, decided that she would be back for the Olympics. Not the 2014 Olympics in Russia. The 2010 Olympics in Vancouver, BC. On Oct. 6, 2008, Canadian ice dancer Tessa Virtue had surgery for chronic exertional compartment syndrome in her shins. Her partner Scott Moir continued to train, lifting sandbags instead, while she recovered. She was back on the ice as soon as she could manage it; like Murray, Virtue was determined to compete in Vancouver. On November 7, 2003, 24-year-old Health Calhoun, a squad leader for the U.S. Army’s 101st Airborne Division, was in a Humvee in Iraq when his convoy was attacked. 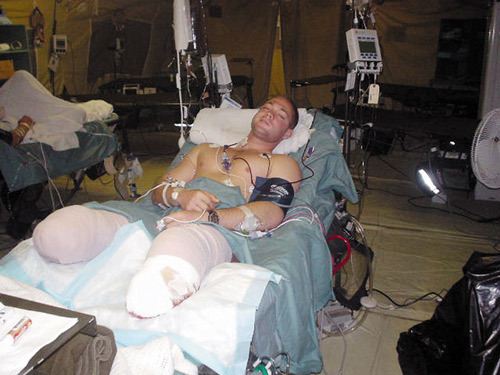 A rocket-propelled grenade destroyed the vehicle, killed a fellow soldier, and damaged Calhoun’s legs so badly they had to be amputated above the knee. After nine months of recovery at Walter Reed Army Medical Center, Calhoun had reconciled himself to the fact that he would probably always need a wheelchair. Later, he met people who changed his mind. And last month, he was in Vancouver as a member of the U.S. Paralympic team. Paralympic skier Heath Calhoun competed in the sitting super-G and the sitting super- combined events in Vancouver. (All photos of Calhoun courtesy of Hanger Prosthetics & Orthotics). These athletes, and dozens like them, owe their success in part to unusual physical strength and stamina, and to unwavering determination. But they also benefit from relationships with physicians, trainers, physical therapists—and, in the case of Paralympics competitors, prosthetists and orthotists—who help them set goals that ordinary people would consider impossible, then show them how to realize those goals. The size and complexity of Olympic events ensures a certain amount of chaos, and the fierceness of the competition means injuries. This year, 2,600 athletes representing 82 countries competed in 86 events in 15 disciplines. 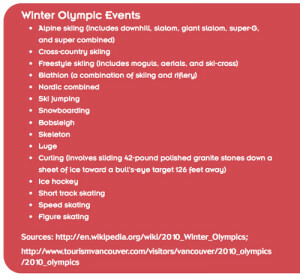 In response, the Vancouver Organizing Committee established and staffed clinics both in Vancouver and in the mountain town of Whistler, where many events took place. The Whistler polyclinic offered medical doctors, physical therapists, chiropractors, acupuncturists, and massage therapists, as well as X-ray, ultrasound, MR, and CT scanners onsite. There was also a mobile operating unit to treat life-threatening injuries in cases where patients could not be evacuated to Vancouver. Though teams from wealthier countries typically travel with their own medical personnel, they used the imaging and laboratory facilities at the polyclinic and consulted with clinicians there. “We saw every kind of injury,” said Kristin Wingfield, MD, a physician at the Whistler polyclinic. In her civilian life, the former competitive gymnast and diver who practices at the Center for Sports Medicine in Corte Madera, CA, an extension of St. Francis Memorial Hospital in San Francisco. She said that at the Olympics, the level of care athletes needed sometimes depended on where they came from. “We treated acute injuries from the Games, but also more chronic injuries in athletes from smaller countries who didn’t have the quality of facilities the polyclinic offered,” she said. For example, Wingfield treated a skier who had had foot surgery the previous summer, but whose inadequate rehabilitation had left the foot chronically stiff and painful—a problem seldom seen in an athlete from a First World country. She also saw plenty of ankle sprains and the knee ligament injuries common to skiers, and said that her proximity to the action was important to quality of care. Calhoun is treated by prosthetist Chad Simpson, BOCP, LP, of Hanger Prosthetics & Orthotics. Wingfield noted that improvements in competitive technology have been a mixed blessing from the perspective of skiers (see “Spotlight on skier safety”). Wingfield added that she’s seen increasingly severe injuries in the super-G and downhill events, particularly tibial–fibular fractures and knee injuries. Because athletes tend to push themselves to extremes before and during the Olympics, therapists and trainers have to communicate effectively with them and their coaches to prevent further damage. Try telling it to Julia Murray. The ski-cross racer, now 21, was born and raised in Whistler. When the World Cup injury blew out her knee, one doctor told her there was little chance she could compete, given that the Olympics were just a month away. So she huddled with Chris Napier, MPT, DSP, physiotherapist and the medical coordinator of the Canadian ski cross team. He treated her two or three times a day to reduce swelling and restore range of motion. By February 2, it was clear that the meniscus wasn’t repairable, so Bob McCormack, MD, a Vancouver orthopedic surgeon, trimmed it arthroscopically. Murray regained full range of motion following surgery. Napier’s approach included electrical stimulation to keep her quadriceps firing, compression and cold therapy, then a progression of exercises from non-weightbearing to weightbearing, then to hopping and ski-specific tasks. After that, Napier had to get Murray back onto the snow. “She started getting her confidence back and the knee felt stable enough that with tape and a brace, she was ready to go,” he said. 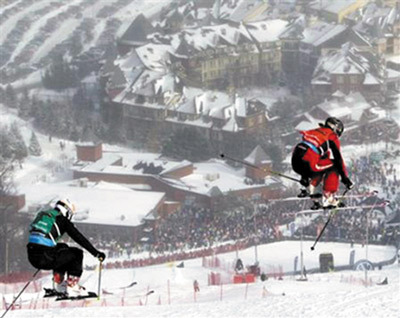 Ski-cross puts huge demands on the knee; racers compete in heats with three others, and they vie aggressively for position as they descend courses that include banked turns, rollers, and jumps. 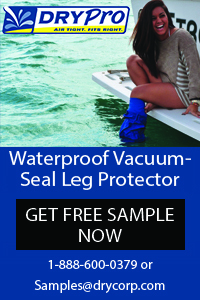 They absorb the shock by entering a crouch, sometimes with their knees up by their ears. Murray didn’t hope for too much right away. She had three days of practice runs before the heats started. The fourth day, she was ready to race. After ice dancer Tessa Virtue’s surgery for compartment syndrome, she had adequate time to recover, during which she formed a strong bond with her own physical therapist, Mary Brannagan, BSc(PT), FCAMPT. Brannagan, who works at Loaring Physiotherapy in Tecumseh, Ontario, was so integral to her recovery that Virtue got Brannagan permission to accompany her to Vancouver even though the therapist didn’t have official accreditation. “She knows my body; she knows what needs to be done to keep me right on top of my game,” Virtue told the Windsor (Canada) Star on Feb. 23. Brannagan applies a wide variety of techniques to treat an elite athlete like Virtue. In the latter case, Brannagan keeps the tissue under tension as she works on it, a technique she learned from another Canadian physical therapist, Laurie McLaughlin, PT, DSc. Brannagan knows results when she sees them, as Virtue’s performance at the Olympics would soon demonstrate. 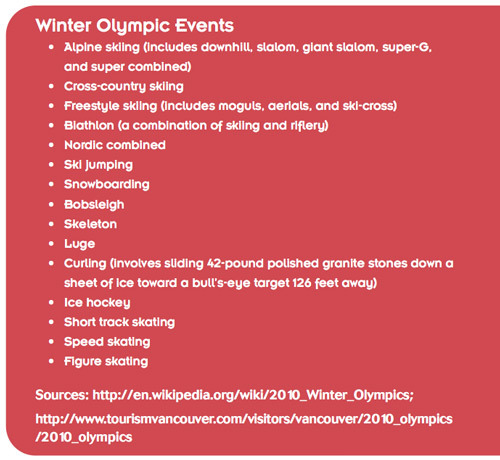 To the athletes, the Paralympics are just as intense as the Olympics, though scaled down (there are five categories instead of 15, and roughly half the number of competitors). Some of the competitors’ needs are identical to those of any athlete, but many require special knowledge and preparation. Dana Rousseau, CP, who works for Pentland’s Prosthetics & Orthotics in Vancouver, BC, treats Paralympics participants and is accustomed to singular needs. Rousseau repaired the limb with higher-quality parts, to the athlete’s delight. 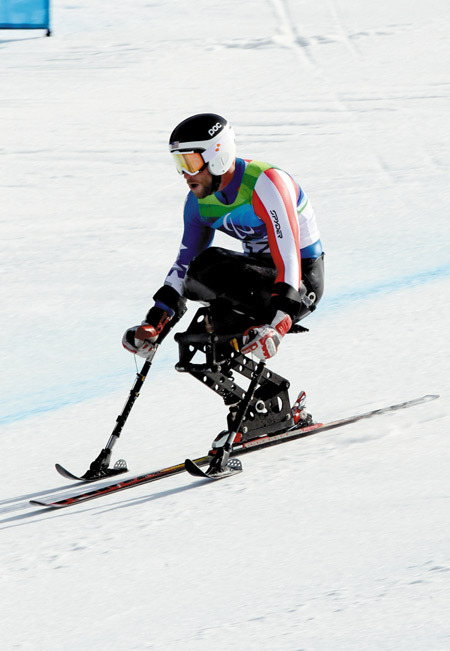 He also had a cross-country skier from Sweden whose prosthetic foot had snapped in half and needed replacing. “We can handle carbon fiber, fiberglass, and welding, and if we can’t do it we’ll find someone who can,” Rousseau sai. For therapists, it’s a better strategy to be proactive rather than reactive whenever possible. In the Paralympics, skiers may compete standing or sitting on a monoski (Heath Calhoun’s approach). 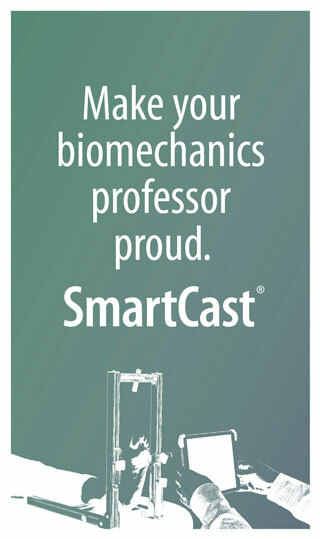 For those who stand, Phillips-Scarlett and her colleagues have developed exercises that account for prostheses. Calhoun lost both his legs in Iraq, when a rocket-propelled grenade hit his Humvee. For a female skier without arms, the team emphasizes balance and strength through the legs and torso, because she can’t use poles or break her falls with her hands. She has suffered concussions, compartment syndrome in her legs, and related maladies. In her experience, visually impaired skiers pose their own challenges. 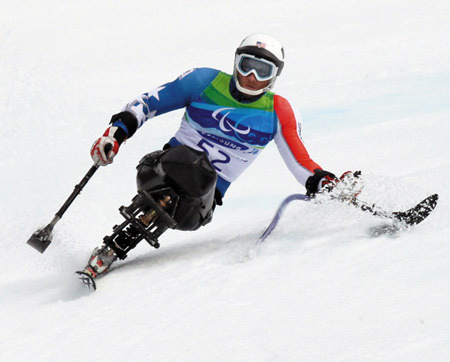 In the Paralympics, skiers may compete by either standing or sitting on a monoski, as Calhoun does. The prospect of skiing down a mountain at 50 mph is daunting for anyone, but try doing it if you have only 10% to 20% of your eyesight. To address this, during training and competition the skiers follow about five meters behind a guide with whom they have trained, and who maintains contact with them via radio headset. Olympic and Paralympic athletes often encounter someone who makes apparently impossible goals suddenly seem attainable. It happened for Julia Murray and Tessa Virtue; it also happened for Heath Calhoun. After his initial rehabilitation at Walter Reed, Calhoun found dealing with prosthetic legs so difficult that he had resigned himself to life in a wheelchair. In 2006, three years after the RPG ripped apart his Humvee, he attended the Amputee Coalition of America national conference in Minneapolis, where he’d been asked to speak about hand cycling (he’d crossed the country that way the year before, pedaling 4200 miles from Los Angeles to Montauk, NY). At the conference, he met Kevin Carroll, MS, CP, vice president of prosthetics at Hanger. Paths of athletes converge for competition, then diverge as they return to the world of everyday life and training. Julia Murray put up a fierce fight, but she got off to a bad start in her second heat and ultimately finished 12th in the ski cross. She has had the knee reconstructed, and will certainly be back. Virtue and her ice-dancing partner, Scott Moir, won gold. They too will be back. Calhoun placed eighth in the men’s sitting super-G and 10th in the men’s sitting super-combined. It wasn’t the performance he was hoping for, but he noted with good humor that placing in the top 10 in the world is never a bad thing. He’s been spending a lot of time away from home, though—training in Aspen while his wife and children live in Tennessee. He’s planning to drive home this month and reevaluate the situation. “The kids are ready for me to come home,” he said. Whether it’s skiing or another sport, however, you can be sure he’ll be doing something athletic, and that sooner or later he’ll excel in it. All three of these athletes will be getting help, of course. Comebacks are about resilience both physical and emotional, and the practitioners associated with world-class athletes understand that every bit as well as the athletes themselves. Cary Groner is a freelance writer based in Northern California.